An area of stenosis (between arrows) where the ‘white’ fluid space of around the spinal nerves is narrowed. Spinal stenosis describes narrowing of the spinal canal. This can affect the central part of the canal where the nerves travel, in the corners where the nerves prepare to exit (lateral recess stenosis) or as the nerves exit (foraminal stenosis). In the picture on the right, the black arrows illustrate an area of central narrowing at the L4/5 level of the spine. Stenosis is often due to degenerative changes in the spine (‘wear and tear’) – with disc bulges, bony spurs (osteophytes), facet joint arthritis, spinal cyst formation and ligament bulging combining to narrow the space around the nerves. It may be associated with spondylolisthesis. Symptoms are often due to compression of the nerves (in the lumbar spine) or spinal cord (in the cervical or thoracic spine). These symptoms are often worse with walking or prolonged standing. Surgery is sometimes needed to relieve the narrowing in spinal stenosis and improve symptoms. The images below show lumbar spinal stenosis before and after surgery. 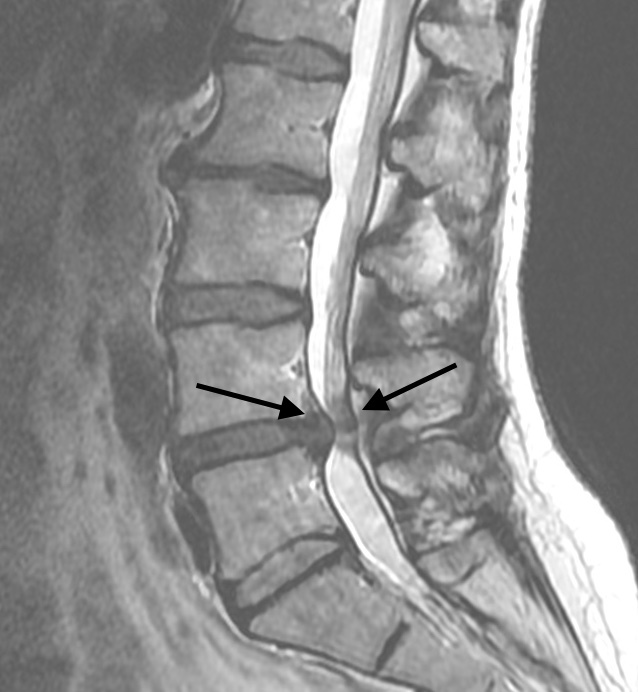 Appearance of spinal canal (white arrows) before (left) and after (right) decompression surgery. 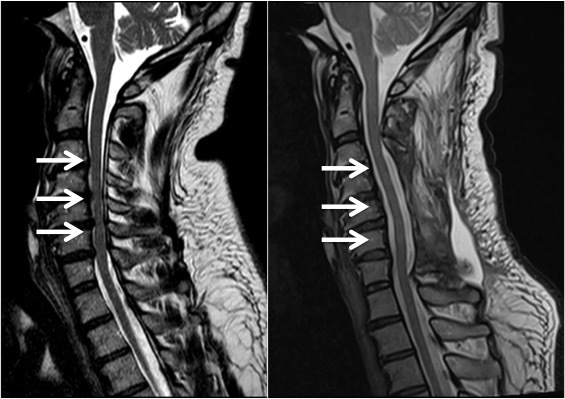 Left : MRI scan appearance of cervical spinal stenosis (white arrows) with spinal cord compression. Right : MRI scan appearance of same patient after decompression surgery. White arrows demonstrate space around grey spinal cord.